Heat oven to 350°F. Place paper baking cup in each of 24 regular-size muffin cups or spray with cooking spray. Bake cake as directed on box for cupcakes, using water, oil and eggs. Cool 10 minutes; remove from pans to cooling racks. Cool completely, about 30 minutes. Spread frosting over cupcakes, mounding frosting in center. Top each cupcake with 2 chocolate candies. 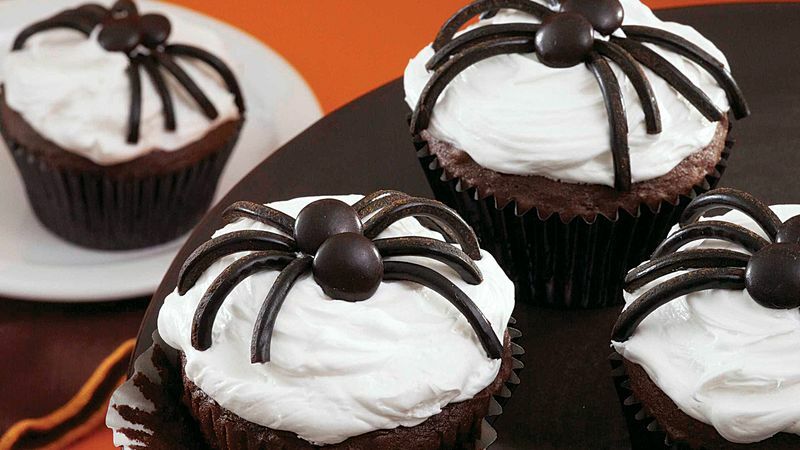 Attach 4 licorice pieces to both sides of candy to form spider legs.